We’d love your help. Let us know what’s wrong with this preview of Miss Julia Raises the Roof by Ann B. Ross. With her husband Sam off on a trip to Europe, Miss Julia reckons it's about time to roll up her sleeves and be of some use to her community. It's then that she hears that the nosy do-gooder Madge Taylor and the new pastor Rucker are embarking on a mission to buy up the vacant house next door to Hazel Marie and establish a group home for wayward teenagers. No stranger to taking in the down-and-out herself, Miss Julia is shocked to learn Madge and the pastor are keeping the project a secret. When Miss Julia and Hazel Marie start investigating, though, they uncover a far less philanthropic plot for the house that even Madge doesn't know about--one that could change the quiet, peaceful neighborhood forever. To ask other readers questions about Miss Julia Raises the Roof, please sign up. (Audio) I was anxiously awaiting for the book to be available and as soon as it was I bought and downloaded it. I have never been so disappointed, mad, frustrated. For years I have had to adjust my mind and enjoy the books despite my feelings about the author whom I abhor. She is obviously racist as she's created a book where all the blacks are poor and work for rich white people in the modern world. Obviously she was wishing "make America great again" long before #45. However despite the blatant (Audio) I was anxiously awaiting for the book to be available and as soon as it was I bought and downloaded it. I have never been so disappointed, mad, frustrated. For years I have had to adjust my mind and enjoy the books despite my feelings about the author whom I abhor. She is obviously racist as she's created a book where all the blacks are poor and work for rich white people in the modern world. Obviously she was wishing "make America great again" long before #45. However despite the blatant racism of the world the characters themselves were not displayed and written as racist so I could enjoy them. That all completely changed with this book-extreme bigotry at it's finest showed it true colors in everyone in this book, all my loveable characters she ruined-Ms. Ross obviously decided to let her own feelings and belief system come into the character because the bigotry showed up and out. No, it was not against a persons color but against the less fortunate. A known do-gooder decided to make a home for 6 homeless boys next to Hazel-Marie and JD and Hazel Marie calls Miss Julia all in tears about it and how she's talked to her other neighbor who doesn't want wayward boys next to her teen and Hazel Marie is concerned about them next to the twins(as if toddler twins are out by themselves) however I understood worrying about how things would be. The book mentioned how their property values will drop based on a shelter being there, I understood that too but when they decided to change it to a foster home that did not apply as foster home with only 6 to 7 boys does not have to be zoned at all. (I've been a foster parent). It would remain a regular house. My issue is that Ms. Ross showed exactly how white people have acted for decades and still act when someone other than them(people of color)move into the neighborhood and they don't want them there. JD builds a concrete wall-that was absolutely ridiculous and I kept thinking it's definitely taking away the curb appeal and if anything that will cause a drop in property value by itself. Then he adopts Thurlough's old dog Ronny just so he can bark at the women trying to work there-which is harassment. Miss Julie takes it upon herself to have her lawyer Binky try to find every legal angle she could to get them out-I could tell Binky didn't agree but she's paid to do her job. Ms. Ross has neighbors selling their home and moving out the neighborhood because of the new riffraff coming in. Miss Julia and Mildred plan a party on the same day and time so no one will attend the New Boys home open house knowing they wouldn't turn her down. Ms. Ross has been Julia basically threatening the new pastors wife behind her back with being kept out of their social circle for supporting the Boys home. So she was using her influence to hurt someone. I never thought much of Helen Stroud but she showed a side of Helen that turned my stomach. Miss Julia, Mildred and LuAnn all noticed things were not right with Helen and how she was treating Thurlough and his dog Ronny so they decide to have an intervention which was just dumb. The decide the issue was Thurlough's money and was she running him into the poor house. It has been mentioned time and time again how rich Thurlough is and we've seen him write personal six figure checks with ease of flicking his finger and how he highly supports his political candidates and makes them do what he wants with his money. There was no way she was spending all his money just by her restoring that house. No one dared to mention that she nearly killed Ronny with her neglect and she was going to kill Ronny and Thurlough through depression by separating them. Helen kept a watch on Thurlough as if he was in prison. She had no care in the world except for that house. What is Sam for anyway? He was supposed to be a retired successful attorney but I've only ever heard him say don't get ahead of yourself Julia, lets wait and see Julia, hmm I don't know Julia. he never says anything with confidence and never comes up with a plan. LuAnne- why is Julia friends with her. Julia apologized and groveled for Helen to forgive her but Ms. Ross writes Julia forgiving LuAnn but doesn't even show LuAnn ever trying to apologize to Miss Julia. LuAnn is not a friend in any way shape or form, she's shown that horrible side in the past. This book showed everything white people do to keep people they don't want out of their neighborhood. Not once did anyone actually talk to the do-gooder to find out how things would be ran or to give her another solution to help her. It was all about just as long as they are not in my neighborhood. The book even got so bad the Lloyd had a friend that was going to live in the house for the homeless boy but JD's position and attitude was making and his friend stressed and depressed because Lloyd would not be allowed to talk to those boys and none could come over there. No one cared that they were actual people and had feelings. Lloyd told Miss Julia his feelings but all she still cared about was making sure they couldn't live there. She cared that the boy was not getting enough food or being properly cared for until he had to live in that home. She didn't say talk to JD about it because she didn't care, she didn't want them next to them. JD didn't care how is attitude and behavior was hurting Lloyd. Hazel Marie, can all she do is whine?- Ms. Ross has reduced her to a whiny twit. Yeah Miss Julia came up with a solution at the end but it was all done with an after thought oh and what she and Mildred did was not bad at all but now Miss Julia is in a position to control whom she wants to buy when they decide to sell. "Law, Miss Julia," Lillian said, laughing. "You a pistol when you get on your high horse." That's exactly what Miss Julia does in this 19th installment of Ann B. Ross's 'Miss Julia' series. I fell in love with these books with the very first and they have held me enthralled ever since. Rip-roaring hilarious, with a special blend of Southern charm and manners, readers will be delighted all over again with this one, for Miss Julia is in excellent form as she sets her sights on one Madge Taylor as t "Law, Miss Julia," Lillian said, laughing. "You a pistol when you get on your high horse." That's exactly what Miss Julia does in this 19th installment of Ann B. Ross's 'Miss Julia' series. I fell in love with these books with the very first and they have held me enthralled ever since. Rip-roaring hilarious, with a special blend of Southern charm and manners, readers will be delighted all over again with this one, for Miss Julia is in excellent form as she sets her sights on one Madge Taylor as the woman tries to set up a home for wayward teen boys in her neighborhood against zoning laws. Even Miss Julia's new pastor, for Pastor Ledbetter has retired, gets in on the action as he casts his lots with the no-good, do-gooder Madge Taylor, who quite simply thinks she is above the law. With Sam off on a much anticipated trip to Europe, Miss Julia and Hazel Marie must put their heads together, with some help from Mildred Allen, to devise a way to keep this unlawful mess out of their neighborhood. IF they don't become persona non grata to the seven churches who are praying against them for being unkind to those in need. Fans of Miss Julia will absolutely love this one! I was laughing out loud numerous times. I declare, Miss Julia and the regular cast of characters are just like my own friends. It was great to catch up with everyone and as always, each time I close the last page of a Miss Julia book, I am so eager for the next. Don't miss this one, folks. Highly recommended. Goodbye, Miss Julia. I've loved this series from the beginning, but some horrible mistake has been made with this story. Mean-spirited, accusatory, and manipulative, it has none of the usual warmth and generous spirit of the past stories. What in the world happened? Miss Julia is completely unlikeable here. The only way she redeems herself, very slightly, is through her money - making things happen the way she wants because she can buy what she wants. And that's rather offensive. While Ross has always had a slightly jaundiced, albeit humorous view of the Christian church (as evidenced by the pastor who featured in the other stories), she still portrayed Julia with a kind heart, flexible spirit, and a willingness to do the right thing. Not here. What an unpleasant character! I found it very difficult to keep on reading, but I finished it, always hoping it would turn around. It didn't. It left me with a very bad taste in my mouth. Goodness, I've so loved every book and even waited in line to get the author's autograph. With a heavy heart, I am leaving this series and will never recommend it again. I was really disappointed and uncomfortable with this book. I've read most of the others and saw them as a way to pass a lazy afternoon with an interesting group of people. I was shocked and disgusted the more I read. I read the entire thing because I kept hoping that there was some joke or some sarcasm in there and I would find it out before the end of the book. I can't believe that she left it that way. It changed the way I view this series and will never read another. At least I borrowed it f I was really disappointed and uncomfortable with this book. I've read most of the others and saw them as a way to pass a lazy afternoon with an interesting group of people. I was shocked and disgusted the more I read. I read the entire thing because I kept hoping that there was some joke or some sarcasm in there and I would find it out before the end of the book. I can't believe that she left it that way. It changed the way I view this series and will never read another. At least I borrowed it from the library and didn't buy a personal copy. What level of civility have we come to as a country that this can be seen as appropriate? I only wish I would have read reviews before not after reading this. This is the first review I've ever written but I feel very,very strongly that this book is disgusting and low class. I was disappointed...long story short. Disappointing. I usually enjoy Miss Julia but this book hit too close to some issues we are currently facing in the world today. The narrow mindedness, the scorn for the "do-gooders" was too close to what we are seeing in our country today. I read a lot of critical reviews of this book as being racist and insensitive. I think those who were quick to judge either didn't finish the book or are themselves quick to shout insensitivity and racism about everything. Unfortunately the latter becoming the norm it seems in this present day. So diluting the word racism that it is likely to fall on deaf ears. Which is unfortunate. --- I am looking forward to Miss Julia's next adventure. I am almost speechless. I have always looked forward to the newest installation of Miss Julia's antics. Always made me happy. Sadly, I will be reading no more of Ms. Ross's books. This was novel that did not hide her racism and stereotyping. "Passing the small independent church that was known for latching on to every liberal cause that came along and calling it progression." "Not only was he foisting junior criminals on us, he intended to settle among us foreign refugees who probably believed t I am almost speechless. I have always looked forward to the newest installation of Miss Julia's antics. Always made me happy. "Not only was he foisting junior criminals on us, he intended to settle among us foreign refugees who probably believed that ecumenical cooperation involved beheading unbelievers." "His mission seemed less as a teacher and caretaker of the flock-- what being a Christian minister once meant-- and more as a social worker and protester of civil wrongs." . Add me to the list of former Miss Julia fans. I kept waiting for her heart to soften, or for someone to set her straight, but gave up and will not be reading any more books by Ann B. Ross. In addition to the hateful NIMBY and anti-refugee garbage, I thought the reason given for Sam's trip to Europe was another unnecessarily divisive detail. Insinuating that there is imminent danger of a "holy way" against European churches is ludicrous at best. I'm not a member of the Christian faith, but I've o Add me to the list of former Miss Julia fans. I kept waiting for her heart to soften, or for someone to set her straight, but gave up and will not be reading any more books by Ann B. Ross. Loved this book! Love this series! Love this author! I would be happy as a clam to be a part of Miss Julia's inner circle and an active participant in all of her high jinks. On a more serious note, this book offers a lot of food for thought on how to be a good neighbor to those in need, as well as where Christianity ends and politics begins. Highly recommend! Reading a Miss Julia book is like visiting an old friend in a nice little town I don't get to visit often enough. Miss Julia is a cranky old trumpette. Ok, but I was beginning to worry about Miss Julia's bias for awhile. town. Julia has money and her husband Sam is a man of means too. They live a very comfortable life. This review has been hidden because it contains spoilers. To view it, click here. I couldn't finish this one. I tried very hard but the ignorance that Miss Julia and pretty much all of the characters in this series show is very frustrating to me. I read to relax, not to get more upset. I have absolutely loved the Miss Julia series since book one but this book took a very different turn. I try to put myself in the character's shoes, knowing I am not anything close to Miss Julia (although I have a very close friend who is much like Miss Julia) and I know that there are others t I couldn't finish this one. I tried very hard but the ignorance that Miss Julia and pretty much all of the characters in this series show is very frustrating to me. I try to put myself in the character's shoes, knowing I am not anything close to Miss Julia (although I have a very close friend who is much like Miss Julia) and I know that there are others that don't see eye to eye with me but her ignorance and bias was just way too much for me. The final straw for me was when Miss Julia seemed to care more about Thurlow Jones's dog than the homeless that Madge and the Pastor were proposing to help. Miss Julia up to her usual shenanigans. 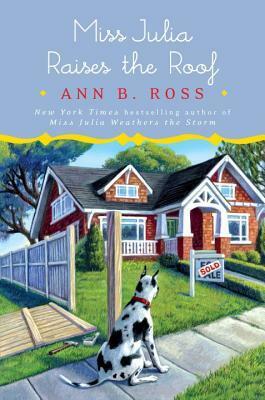 Ann B Ross makes her characters so true to life. Miss Julia wrestles with moral, spiritual, and relationship dilemmas we can all relate to. I appreciate that Miss Julia has aged along with me and managed to keep her good humor while displaying her virtues and foibles. Another great Miss Julia book. Its been a few years since I read one of these books. But this one is as good as the others. As normal, for Miss Julia, she has a way to get herself in some trouble or in the middle of a problem. But she always does it out of the goodness of her heart. Somehow this seems to have missed the mark a bit.... Julia comes across as harsh, judgemental, and manipulative. She does at times question her actions, but then justifies most of them. Ending was rushed and awkward. Not her usual heart-warming read, which were fun to read between more serious selections. Another series I've enjoyed has gone awry. Did I like this because it was fairly good, or because I liked its predecessors in the series? Sometimes with these long-running series it can be hard to tell. Miss Julia is outraged when a local do-gooder, abetted by her own church, buys a house next door to Hazel Marie's, and starts turning it into a group home for at risk teen-aged boys. Miss Julia's worst fear is that Hazel Marie's family will move away from their neighborhood, and she tries to stop the project. Well, I didn't get to see as much of Latisha, but Ronnie the dog was fun! Another most enjoyable book in this series, and now I have a wait for the next one. Come on, Ms. Ross! Write fast! 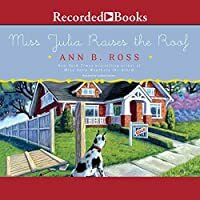 Ann B. Ross, who taught literature at the University of North Carolina at Asheville, is the author of Miss Julia Speaks Her Mind, one of the most popular Southern debut novels in years, Miss Julia Takes Over, Miss Julia Throws a Wedding, and Miss Julia Hits the Road. She lives in Hendersonville, North Carolina.